The perfect product for repairing all types of plumbing fixture surfaces (sinks, bath tubs, shower surrounds, toilets). Utilizes the most advanced Light-Curing Acrylic (LCA) gel technology to completely repair surface damage on virtually any white colored china, porcelain, fiberglass and acrylic plumbing fixture in a kitchen or bathroom. White color will match most Kohler white plumbing fixtures. 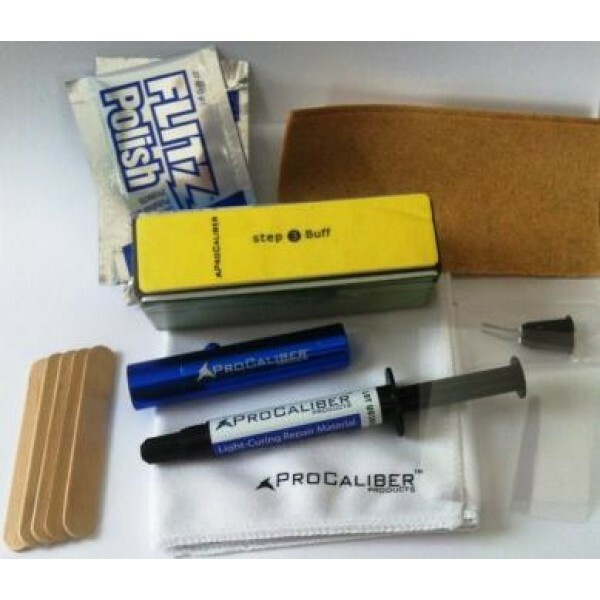 With this kit any homeowner or professional service contractor or technician has the ability to perform the most professional, complete, invisible and permanent repair possible. Each repair can be done in less than 15 minutes and never needs to be revisited again. The time you save utilizing our LCA system will enable you to repair larger damaged areas and/or greatly increase the amount of jobs you can perform while increasing the quality and customer satisfaction of each repair. Each Kit contains enough material to perform 15-25 repairs.